The entire benign space-occupying lesions – either extra- or intraneurally located – are described here. The list of tumors consist of schwannomas (neurinomas), neurofibromas, plexiform neurofibromas, perineurioma, nerve sheath myxoma (neurothekeoma), haemangioma, fibrolipoma, and ganglia, whereby the latter ones can occur as extraneural or intraneural manifestations. Intraneural ganglion cysts are often manifested multiply within a special nerve segment. The importance and value of modern imaging concerning this kind of focal nerve lesion has of course to be outlined. Surgical aspects with regard to each tumor type are stressed as far as experience allows. 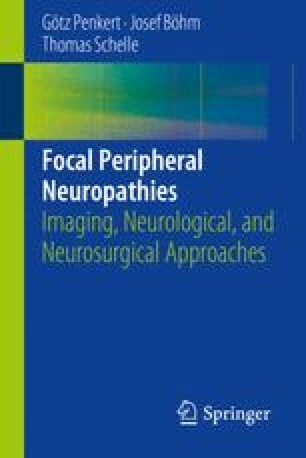 The special difficulties that plexiform neurofibromas and perineuriomas present have to be pointed out if one is to consider surgical treatment. Concerning surgery of ganglion cysts, the importance of identifying and ligating a communication to the neighbouring joint is demonstrated and reinforced by specialist literature.